for the last month or so. i've seen my brake light on and i've been meaning to get this fix. the first thing to do is to check under tha car on each of the four tires to make sure that there is no oil leaking. if there is oil leaking then you should STOP NOW and take your car to a mechanic to have them check your break lines. this is dangerous. you're brakes can stop failing anytime. if you checked and you see no oil dripping near your breaks or tires inside and outside underneath the car. 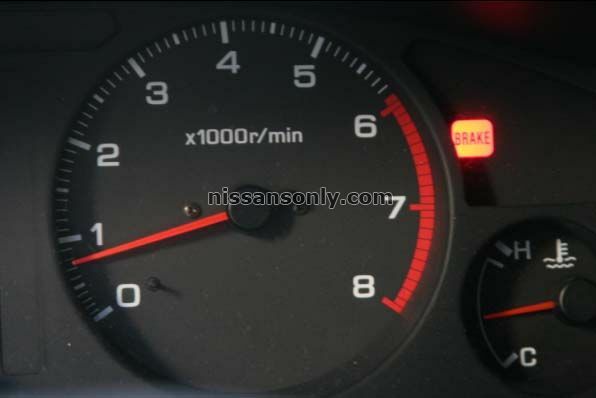 then if your break light is on its because you are low on fluid. in my case, i had new breaks a while ago, and so this is normal because as my breaks start to wear out, it takes more fluid to press them in. first this is to locate where the break reservoir is at. its usually located on the left side of the vehicel.. or the driver said (that's because its near the break pedal)..
once you've found it. read the instruction on the cap. on my cap, it said to use DOT3, so that' what i bought. DOT3 is the standard here in United States. you will notice that the break light is now gone. you just saved $100 from the dealer.